This page in a nutshell: These days, we have so many choices for communicating. However, some ways and means are better than others, and I encourage you to use those. Communication is integral to success, no matter what we’re talking about. In a digital world, these literacies are particularly important. Not only should you develop and perfect your communication skills while in college, you need to use those skills everyday with your peers and professors. You must be present and participate. More importantly, if you must miss a class session, communication is even more important to get caught back up. Don’t be shy: communicate. My office hours are listed on the contact page of this site. They are updated each semester, depending on my teaching schedule. If you cannot make it during my posted office hours, you may contact me for an appointment. Increasingly, I teach online, so traditional “office hours” are increasingly passé. During the Spring semester 2005, the university began using the email account provided free of charge to all students as an official means of communication. Therefore, you should become familiar with the email system and get into the habit of checking it regularly, at least once a day. Please use my MGA email address; never use the D2L system. Seriously, did you look in the syllabus? Do a search? Please be considerate when emailing your professors: always include your name, the class that you are in, and why you are emailing me. 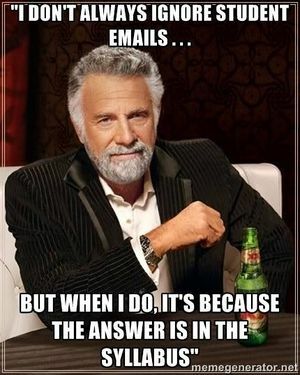 Also, please use a descriptive subject line so I can tell right away what your email concerns. Sending me the complete information will not only make my life easier, but shows consideration for your recipient and will result in a speedy response. This said: any email that does not contain all of the necessary information will be deleted. Thank you for your thoughtfulness. I usually do not check email on weekends or holidays. Thank you for your understanding. Do not send the same message to me twice. I.e., do not send me an email at my MGA address and CC me at another. You only need to send it to me once. If you do not hear back from me within 24 hours (excluding weekends), then you might wish to review your sent message for any of the above errors. During office hours and sometimes beyond — though rarely on the weekends — I will be available on Skype for video conference. Sometimes I will use Skype for midterm conferences. Email me to schedule a meeting. Students should be familiar with the general uses of a computer (especially if they are taking an online course) — i.e., how to navigate in an operating system: launching programs, quitting programs, creating directories and files, etc. Students should also be familiar with the uses of the Internet, specifically a Web browser. All course material will be delivered hypertextually, making this requirement paramount. Even if students lack the abilities needed for the class, they should be willing to put forth the effort to learn what they need to in order to succeed in the course. Computer competency is an integral skill in any discipline, and this course uses digital technology in an effort to promote technological literacy in the humanities classroom and beyond. Please see me for additional assistance when necessary. And, if you do not understand something, ask. ↑ Email is a dying medium. Between the spammers and proprietary systems, it has gotten out of hand. It is clunky and takes up way too much of my time. Therefore, I am spending less time with it. For a faster response, consider contacting me through Slack, Twitter (@drgrlucas), or one of the social services listed on my About page. This page was last edited on 15 January 2019, at 07:48.